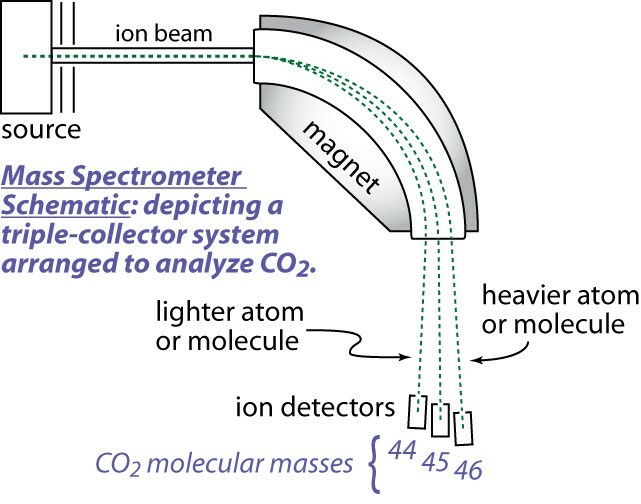 Gas source mass spectrometers are the principal instruments used for measuring isotopic ratios of light elements, including hydrogen, carbon, nitrogen, and oxygen. The sample is prepared in gaseous form, often hydrogen, nitrogen, or carbon dioxide, and inlet into the mass spectrometer for analysis. These instruments are designed to analyze very precisely the isotopic composition of gaseous samples. In many applications the sample preparation is an important aspect, and often the mass spectrometry is more precise than the reproducibility of sample preparation. Historically, gas source mass spectrometers are the instruments used for measuring H/D, 13C/12C, 15N/14N, 18O/16O ratios. Gas Source Mass Spectrometry: Stable Isotope Geochemistry Instrumentation - How Does It Work? 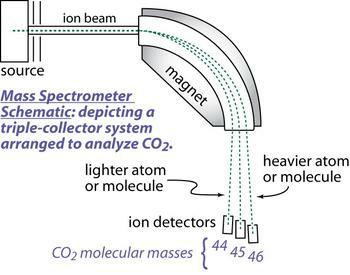 The gas source mass spectrometer includes three fundamental parts, (1) a "source" of positively charged ions or molecular ions, (2) a magnetic analyzer, and (3) ion collectors. The source is a low-pressure chamber (~10-5 torr) into which sample or standard gas is ionized, either by an electron beam produced by a hot filament, or by a strong electrostatic field. Once formed, the ions are accelerated and focused by charged plates into a beam that enters a flight tube. The flight tube has a bend that coincides with an electromagnet that alters the path of the ions according to their mass/charge ratio, thus several beams leave the magnetic sector. Multiple ion detectors are arranged to collect the ion beams of interest. These collectors measure each beam as a current that can be amplified and determined with high precision. Gas source instruments utilize one of two types of inlet systems, either a "viscous" gas flow inlet, or a "continuous" gas flow inlet. Viscous gas flow systems use a dual-inlet system that allows alternation between a "standard" gas (of known isotopic composition) and a sample gas (isotopic composition to be determined). Multiple measurements of each gas are used to calculate the isotopic composition of the sample gas. Instrumental precision of such measurements is typically greater than the sample reproducibility. Continuous gas flow systems use a carrier gas such as helium to carry the gas into the ion source chamber. An "open-split" device allows equivalent inlet conditions for both standard gas and sample gas. Continuous flow systems permit coupling of a gas chromatograph to a mass spectrometer for compound specific isotopic analysis. Viscous flow systems allow high precision analyses, but require a relatively large sample size in order to ensure viscous flow, which inhibits fractionation processes in the flow system. Only a small fraction of the gas is actually analyzed. Continuous flow systems yield lower precision analyses, but allow measurement of much smaller sample size. A new generation of large radius SIMS instruments (secondary ion mass spectrometers) optimized for light stable isotopes are now available to augment the traditional stable isotope work done with gas source mass spectrometers. Because these are expensive to build and operate, they are likely to remain few in number. Their chief advantage is the ability to analyze small spots on minerals in situ with the same precision as conventional gas source instruments. For example, visit the Wisconsin Secondary Ion Mass Spectrometer Laboratory. Stable isotope geochemistry is used to study so many geological processes that applications span all fields of the geosciences. Variations in bond strength and related variability in molecular vibrational modes lead to mass-dependent isotopic fractionations among different phases. This is most readily observed for light elements in which the mass differences are relatively large, for example hydrogen through oxygen, and also sulfur. Mass-dependent fractionations result in different isotopic ratios in different compounds in equilibrium. The magnitude of isotopic fractionations depends on temperature. This is really useful! For example, the isotopic composition of precipitation depends in part on the temperature. Seawater in the open ocean has close to the same isotopic composition everywhere, but as one travels north or south from the equator, the precipitation becomes isotopically lighter. The glacial ice that has built up on Greenland from precipitation over the past 100,000 years contains a record of isotopic variation that corresponds to fluctuations in climate. Quaternary geologists read the climate history of the ice ages in the isotope record of the ice (Alley, 2002). Isotopic fractionations should decrease to zero, theoretically, as temperature increases to infinity. At infinite temperature, the vibrational energy and strain on bonds would be so great that it wouldn't matter which isotope is present1 (O'Neil, 1986). So isotopic fractionations tend to be largest at low temperatures. The temperature dependence of isotope fractionations allows stable isotopes to be used for geothermometry, that is, the isotopic composition of two phases assumed to be in exchange equilibrium can reveal the temperature of their equilibrium exchange (Chacko et al., 2001; Valley, 2001). Stable isotopes are useful in two important ways. One is as a geochemical tracer. As elements cycle through various reservoirs of natural systems, the isotopic ratio of an element in rocks or other material can elucidate the movement of elements through these reservoirs. Secondly, stable isotope ratios of two substances can be used to constrain the temperature of their exchange, if one can assume equilibrium. Applications of stable isotope geochemistry include paleoclimatology, igneous petrology, sedimentary petrology, metamorphic petrology, economic geology, biogeochemistry, hydrogeology, marine science, paleontology, extraterrestrial geochemistry, global geochemical cycles, and on and on. In addition, many new directions have been developed regarding stable isotope geochemistry of non-traditional elements such as Li and Fe, just to name a couple (for example, see Johnson et al., 2004; Tomascak, 2004). 1 This is also true of cation exchange thermometers, such as garnet-biotite. The distribution coefficient approaches a value of one (i.e., no fractionation) as temperature approaches infinity. Strengths and Limitations of Gas Source Mass Spectrometry: Stable Isotope Geochemistry? Gas source mass spectrometry has been the principle instrument for stable isotope work of all kinds, and will continue to be for many years, although large radius SIMS instruments are available and capable of exciting new possibilities (See "how does it works" above). Each element has its unique analytical limitations. In general, hydrogen has the largest analytical uncertainty (± 0.5-2.0???) and other light stable isotopes (C, N, O, S) are reported to within ± 0.1-0.2???. In most cases, the limiting factor in practice is sample reproducibility. That is, sample duplicates vary more than the mass spectrometer variation of a single gas sample, and thus, instrumental precision is more than adequate for most applications. Sample preparation varies from element to element and also depends on the nature of the sample material. Also, viscous flow mass spectrometers generally involve different sample preparation than continuous flow instruments (see above). One thing they all have in common: the sample is prepared in gaseous form to enter the mass spectrometer. 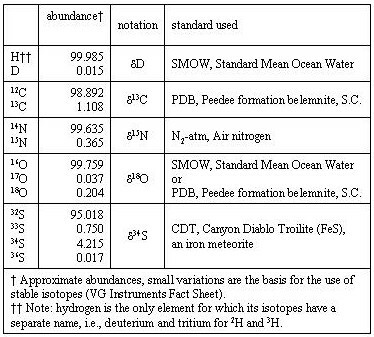 The abundances of isotopes of the commonly used stable isotopes and the standards employed are given in Table 1. Alley, R.B., 2002. The Two-Mile Time Machine: Ice Cores, Abrupt Climate Change, and Our Future. Princeton University Press. ISBN 13: 978-0-691-10296-2. Chacko, T., Cole, D.R., and Horita, J., 2001. Equilibrium oxygen, hydrogen, and carbon isotope fractionation factors applicable to geologic systems, in Stable Isotope Geochemistry (Valley, J.W. and Cole, D.R., Eds.). Reviews in Mineralogy and Geochemistry, Vol. 43, p. 1-81. Mineralogical Society of America, Washington, D.C.
de Groot, P.A. (Ed. ), 2004. Handbook of Stable Isotope Analytical Techniques, Volume 1. Elsevier, San Diego, USA. Faure, G. and Mensing, T.M., 2005. Isotopes: Principles and Applications, Third Edition. John Wiley & Sons, New Jersey. Hoefs, J., 2004, Stable Isotope Geochemistry, 5th ed. Springer, New York. Johnson, C.M., Beard, B.L. Roden, E.E., Newman, D.K., and Nealson, K.H., 2004. Isotopic Constraints on Biogeochemical Cycling of Fe. In: Geochemistry of Non-traditional Stable Isotopes (Johnson, C.M., Beard, B.L., and Albarede, F., Eds.). Reviews in Mineralogy Geochemistry, Vol. 55, 359-408. Mineralogical Society of America, Washington, D.C.
Kendall, C. and McDonnell, J.J. (Eds. ), 1998. Isotope Tracers in Catchment Hydrology. Elsevier Science B.V., Amsterdam, 839 p.
Ohmoto. H. 1986. Stable isotope geochemistry of ore deposits. In: Stable Isotopes in High Temperature Processes (Valley, J.W., Taylor, H.P., and O'Neil, J.R, Eds.). Reviews in Mineralogy, Vol. 16, p. 491-570. Mineralogical Society of America, Washington, D.C.
O'Neil, J.R., 1986. Theoretical and experimental aspects of isotopic fractionation. In: Stable Isotopes in High Temperature Processes (Valley, J.W., Taylor, H.P., and O'Neil, J.R, Eds.). Reviews in Mineralogy, Vol. 16, p. 1-40. Mineralogical Society of America, Washington, D.C.
Shanks, W.C. III, 2001. Stable isotopes in seafloor hydrothermal systems: vent fluids, hydrothermal deposits, hydrothermal alteration, and microbial processes. In: Stable Isotope Geochemistry (J.W. Valley and D.R. Cole, eds. ), Reviews in Mineralogy and Geochemistry, Vol 23: 469-525. Sharp, Z., 2007. Principles of Stable Isotope Geochemistry. Prentice Hall, New Jersey. Tomascak P.B., 2004. Developments in the understanding and application of lithium isotopes in the Earth and planetary sciences. In: Geochemistry of Non-Traditional Isotope Systems (Johnson CM, Beard BA, and Albarede F., Eds.). Reviews in Mineralogy Geochemistry, Vol. 55, 153-195. Mineralogical Society of America, Washington, D.C.
Valley, J.W., Stable isotope thermometry at high temperatures. In: Stable Isotope Geochemistry (Valley, J.W. and Cole, D.R., Eds.). Reviews in Mineralogy and Geochemistry, Vol. 43, p. 365-413. Mineralogical Society of America, Washington, D.C.
For more information about Gas Source Mass Spectrometry: Stable Isotope Geochemistry follow the links below. Check out these excellent resources from the European Association of Geochemistry Nuts and Bolts of Mass Spectrometry Short Course 2012 -- Great tutorials on the basics of mass spectrometry! Teaching activities, labs, and resources pertaining to Gas Source Mass Spectrometry: Stable Isotope Geochemistry.